Effective July 1, 2006, AB 1125 requires retailers to take back and recycle the rechargeable batteries they sell. This new law provides consumers with numerous locations to recycle old cellular phones. Accepts any kind of rechargeable battery. Such as auto, RV, cell phones, laptops, cordless phones, IPods, cordless tools, etc. Drop off only. Accepts any type of rechargeable battery. Accepts any kind of rechargeable battery. Accepts any kind rechargeable battery. Batteries are banned from the trash because they contain metals and other toxic and corrosive chemicals that can leach into the environment. All batteries, including sizes AAA, AA, C and D, need to be disposed of as Household Hazardous Waste. 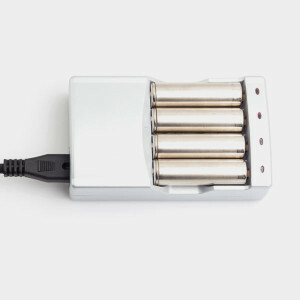 Office Depot allows consumers to bring their rechargeable batteries to any location for free recycling. Find the nearest store. The Rechargeable Battery Recycling Corporation set up a no-cost recycling program, with collection sites all across the United States and Canada. Find out more. One battery recently caused an explosion in a UK garbage truck, starting a fire and contaminating over six tons of recycling. Because batteries contain chemicals that can ignite, it is important to dispose of them correctly, and not just toss them in with other trash or recycling. “A battery will do for the electricity supply chain what refrigeration did to our food supply chain” said MIT electrochemist Donald Sadoway in a Grist article. Sadoway and his peers are developing new battery technology using materials such as molten metal and saltwater. The energy-storage capacity of these technologies could lead to a new era for electric cars and the electricity grid.